Yesterday evening, my mother and I had the honor of enjoying a period meal with Mr. Jefferson Davis, President of the Confederacy, at Walkerton Tavern, a circa 1824/5 tavern and meeting house literally around the corner from my house. The program was presented by Henrico County’s Division of Recreation and Parks and the Henrico Historical Society, and we had the pleasure of dining on food authentic to Richmond in 1863, as well as hearing from President Davis (interpreter Phil McGourty) on the state of the war and wartime Richmond. When we arrived, the ambiance of the venue set the tone for the evening. Walkerton Tavern has been used as a tavern, meeting house, post office, voting precinct and field hospital for wounded Union cavalrymen in 1864. The building and grounds are gorgeous, and the interior has been restored beautifully. 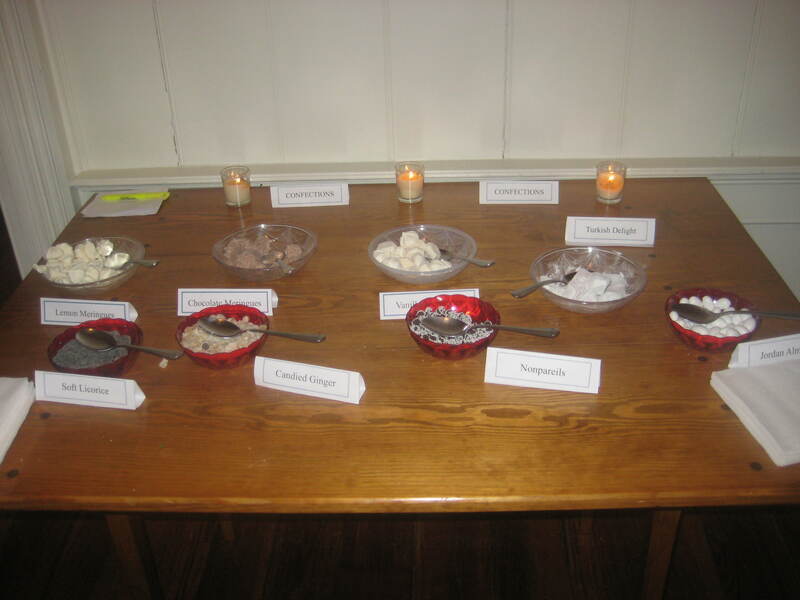 On the second floor, we entered the dining room, stopping first just outside the door to have a look at a period dinner menu and enjoy some sweet treats. 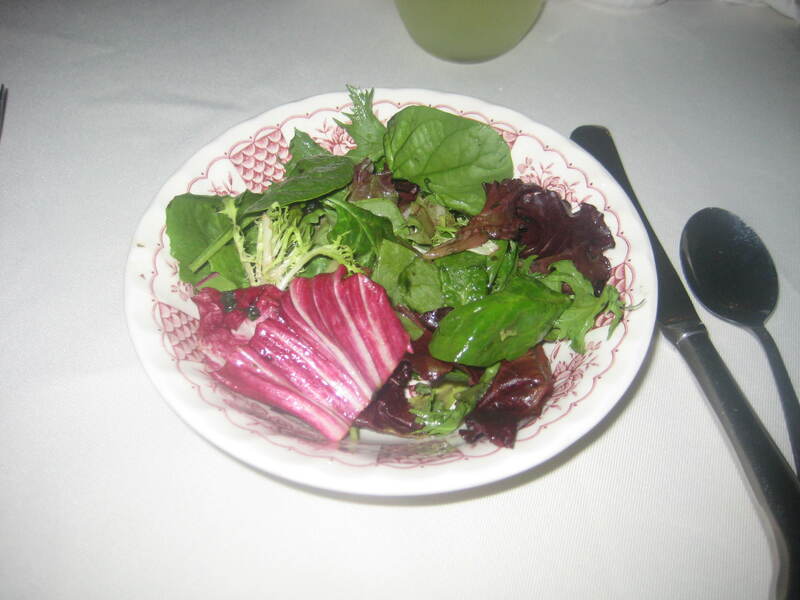 After a brief introduction of the participants and what to expect from the evening, we were brought our first course, a green salad with a vinegar-based dressing. Vinegar dressings were par for the course in the 1700’s and 1800’s, and inventive chefs infused their vinegar with all sorts of herbs and spices to improve its flavor. Thomas Jefferson, for example, was a fan of tarragon vinegar dressing for his salads. Our salad was fresh, the dressing tangy, yet delicate. 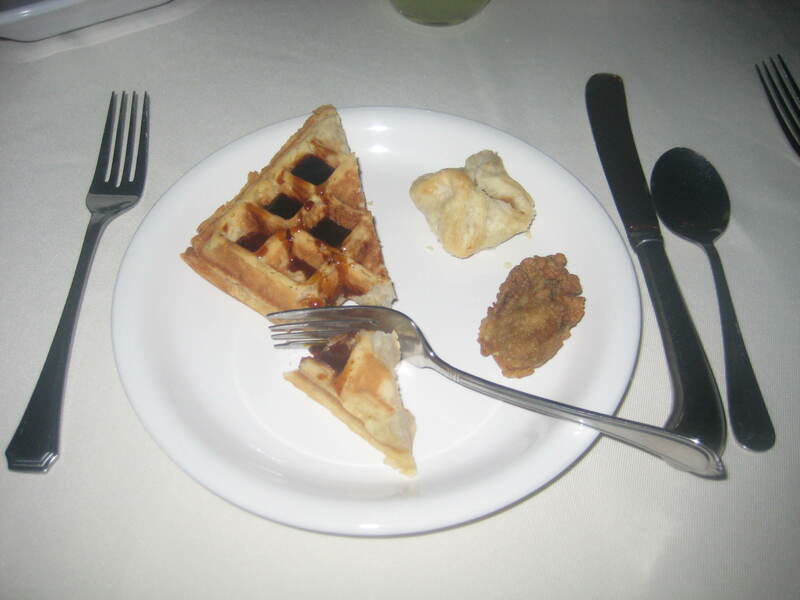 For our appetizers, we were served a platter of rice waffles, sweet potato puffs and fried oysters. Molasses was available at the table to top the waffles, which were large and dense, made, as the name suggests, of a batter containing rice. The fried oysters were a Virginia specialty, and these were plump, crispy and delicious. The sweet potato puffs were similar to the pumpkin puddings I’ve made before for this blog (Mary Randolph’s Pumpkin Pudding), and were light and not overly sweet. The recipe is at the end of this post. 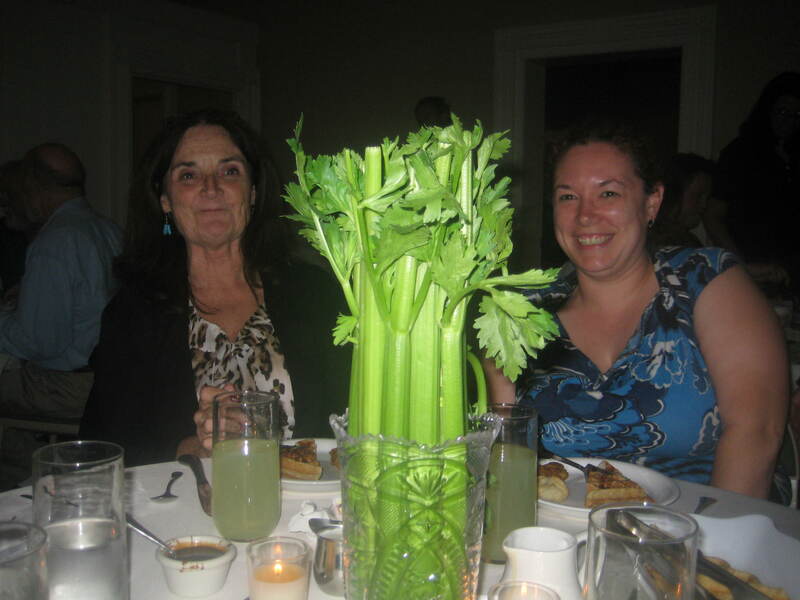 Between the appetizers and the main course, several attendees asked the program presenters about the centerpieces at each table – which were bunches of celery! Apparently, celery was considered a great palate cleanser, and tables of the time were often dressed with vases filled with celery so guests could have a stalk or two between courses. This led to the creation and manufacturing of vases specifically made to hold bunches of celery, and ladies’ magazines of the time had articles about which company made the best (and worst) celery vases. Later, the vases were replaced with long, oval dishes in which to lay the celery stalks. Our main course consisted of quail stuffed with a venison sausage and cornmeal stuffing, roasted potatoes, squash and spinach. I had never had quail before, and I very much enjoyed it. It had a flavor and texture nearly identical to dark-meat chicken, but a bit more of a delicate taste. The venison sausage stuffing was delicious – just a tiny bit spicy, and paired well with the quail and the white sauce. The potatoes were small chunks of roasted potatoes tossed with herbs, while the squash was mashed and roasted. The spinach was formed into a small patty and was held together with a bit of egg. All in all, the quail and venison sausage stuffing were the standouts of the main course. 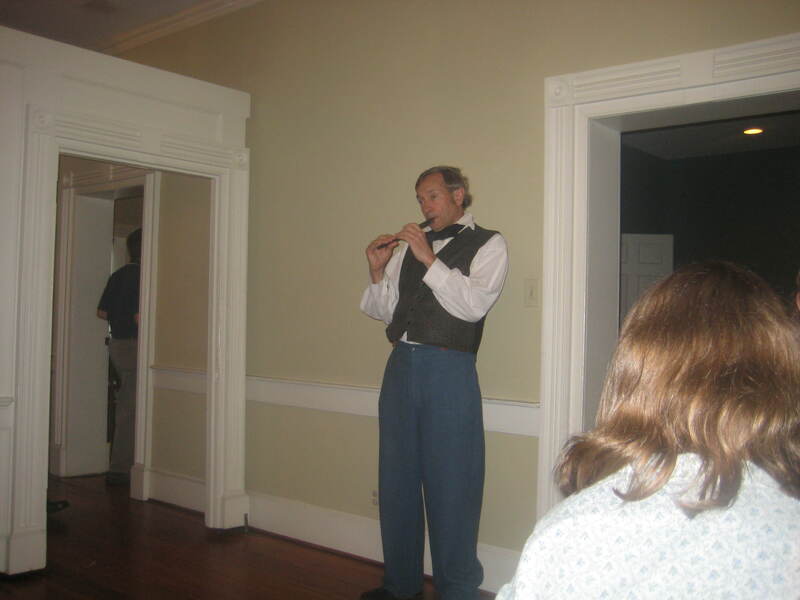 During the dessert course, which was Jefferson Davis Pie, President Davis himself got up to speak. 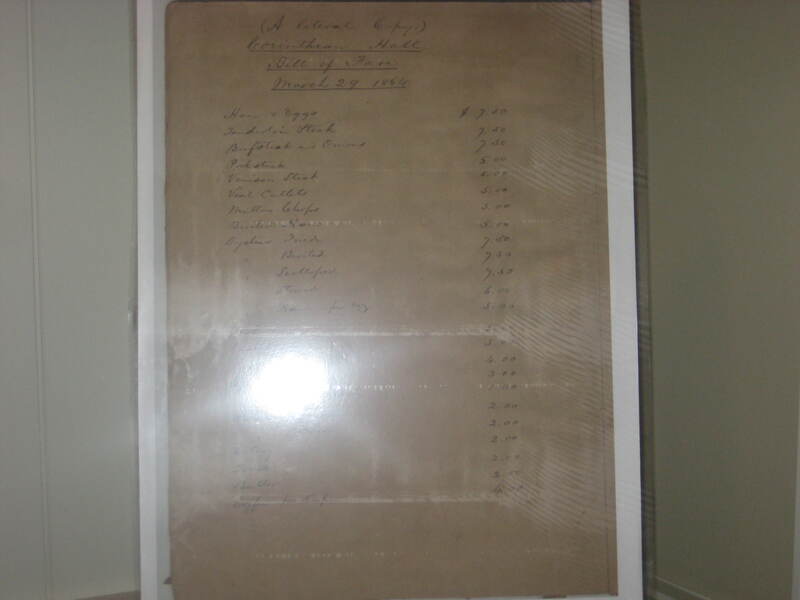 He told us news of several events that had happened in the city in early 1863, including the explosion at the armaments factory on Brown’s Island, which killed a young Irish girl who lived in Oregon Hill. He took questions from the audience, both in and out of character. We learned that Mr. McGourty had begun his illustrious political career as a re-enactor, and had been told by numerous other re-enactors of his resemblance to Confederate President Jefferson Davis. As he moved up through the ranks of re-enactors (and as he realized that the re-enactor community had an overabundance of Abraham Lincoln’s, and not nearly as many Jefferson Davis interpretors), he warmed to the idea of portraying the President of the Confederacy. President Davis discussed his family, including his wife Varina, and his young son who, sadly, fell to his death off a balcony at the White House of the Confederacy in downtown Richmond. Overall, the dinner and program were quite enjoyable. The food was tasty, the historical perspective was informative, and I got to meet and talk with several interesting people at my table. 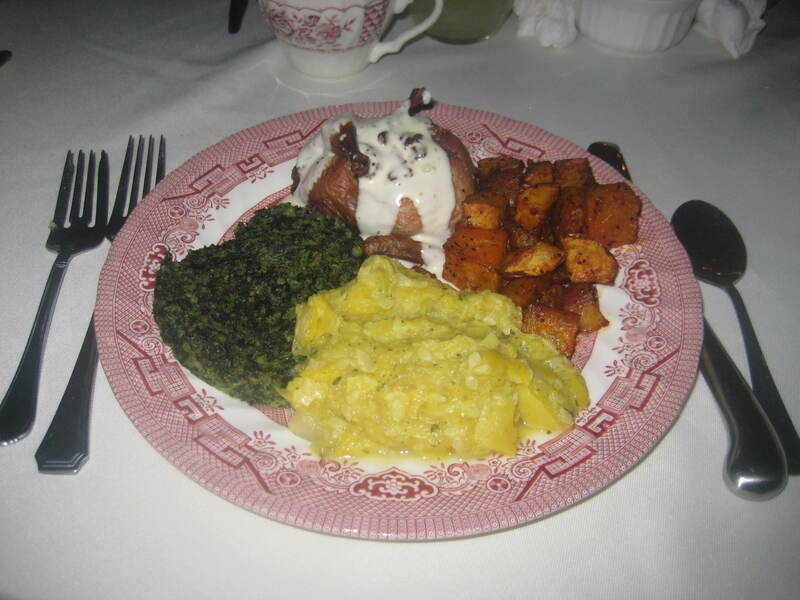 The Henrico County Division of Recreation and Parks and the Henrico Historical Society plan to hold a similar meal in October, so keep an eye on their website for details as they become available. Pound the spice, allowing a smaller proportion of mace than of nutmeg and cinnamon. Boil and peel some sweet potatoes, and when they are cold, weigh a quarter of a pound. Mash the sweet potato very smooth, and rub it through a sieve. Stir the sugar and butter to cream. Beat the eggs very light, and stir them into butter and sugar, alternately with the sweet potato. Add by degrees the liquor, rosewater and spice. Stir all very hard together. Spread puff-paste on a soup place. Put in the mixture, and bake it about half an hour in a moderate oven. Grate sugar over it.